The following is an excerpt from the October Margie’s Muse column. I’m in the process of writing my 5th book, The Beader’s Guide to Jewelry Design. Because I want to make it invaluable, I’ve been soliciting feedback from my newsletter subscriber list and Facebook. I asked about the challenges you face as a jewelry designer in several arenas: color, composition, style, durability, wearability, and more. Rosanne Andreas responded “…working with iris/metal beads is a color challenge.” Since the topic of last month’s Margie’s Muse column was “Escape the Dark Metallic Iris Trap,” I’d like to explore some of the most aesthetic approach to incorporating metallic iris beads in jewelry. First, let’s visually dissect the metallic iris bead. When we look at the bead we are seeing three things simultaneously: the actual base color of the bead, a coaing on the surface much like shifting oil slick colors, and a reflective “hot spot” (a bright white dot reflecting the source of illumination right back to us). Each bead is like a little planet with its own surface (the original color), atmosphere (the AB finish), and sun (the hot spot). Keep in mind that all of this is taking place on every single bead. 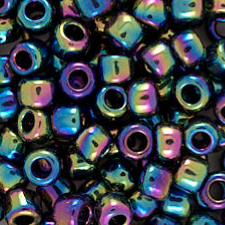 Visually, these are active, busy beads. « What’s Your Matchy-Matchy Threshold?